441 Marlborough is located on the north side of Marlborough, between Massachusetts Avenue and Charlesgate East, with 439 Marlborough to the east and 443 Marlborough to the west. 441 Marlborough was built in 1885 for Chadwick & Stillings, for speculative sale, one of eight contiguous houses (431-445 Marlborough). Chadwick & Stillings (N. Henry Chadwick and Oscar L. Stillings) was a hat block and flange company that became a significant house building firm in the 1880s and 1890s. They are shown as the owners, architects, and builders on the original building permit applications for 431-445 Marlborough, dated June 16, 1885, and on the final building inspection report, dated November 13, 1886. The houses were built under an agreement with Henry Whitney, who owned the land. He sold them the lots at 437-445 Marlborough and retained the lots at 431-435 Marlborough. Chadwick & Stillings built all eight houses and then they sold the houses at 437-445 Marlborough and Henry Whitney sold the houses at 431-435 Marlborough. The land was part of a parcel Henry Whitney had acquired in two transactions, on November 24, 1882, and on March 20, 1885, all part of a tract of land originally purchased from the Boston Water Power Company on June 1, 1880, by a real estate investment trust formed by Francis A. Palfrey, Francis A. Osborn, and Grenville T. W. Braman. 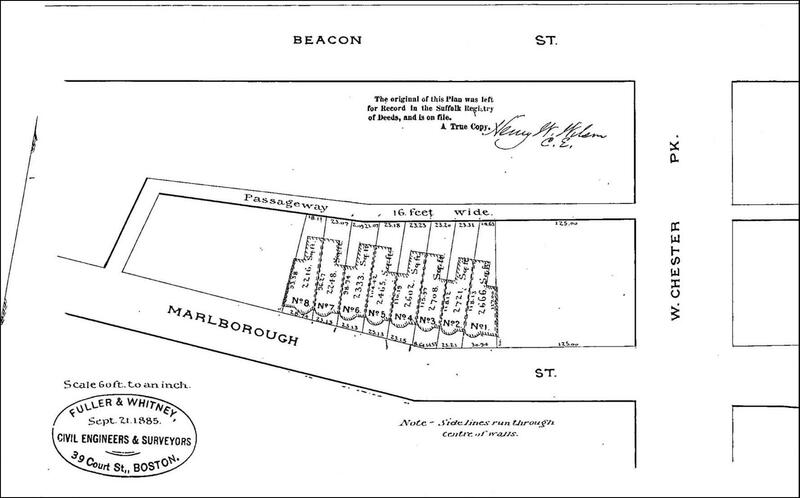 Click here for an index to the deeds for 441 Marlborough, and click here for further information on the land west of Massachusetts Avenue between the south side of Beacon and the north side of Commonwealth. On April 28, 1887, 441 Marlborough was purchased from N. Henry Chadwick and Oscar L. Stillings by Sarah Anna P. (Emery) Hallett, the wife of banker Daniel Bunker Hallett. They previously had lived at 26 Concord Square. Sarah Anna Hallett’s mother, Frances Gorham (Brewster) Emery, the widow of Moses Gill Jefferson Emery, lived with them until her death in January of 1889. The Halletts continued to live at 441 Marlborough during the 1889-1890 winter season, but moved thereafter to the Hotel Oxford (southeast corner of Exeter and Huntington). They subsequently moved to The Ericson at 373 Commonwealth and then in 1900 to the Hotel Tuileries at 270 Commonwealth. Sarah Anna Hallett continued to own 441 Marlborough and lease it to others. By the 1890-1891 winter season, it was the home of William Henry Bowker, president of the Bowker Fertilizer Company, and his wife, Charlotte Jeanette (Ryder) Bowker. They previously had lived at 250 West Newton. They continued to live at 441 Marlborough during the 1903-1904 winter season, but moved thereafter to 403 Beacon. By the 1904-1905 winter season, 441 Marlborough was the home of Mrs. Ella Louise (Utley) Swain Cummings, the widow of Edgar Catlin Swain and the former wife of John J. Cummings. 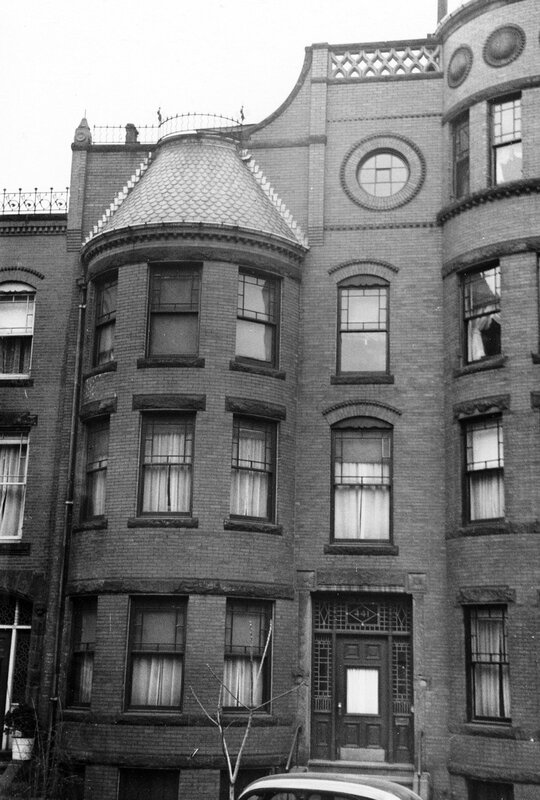 She continued to live there during the 1905-1906 winter season, but moved thereafter to an apartment at The Charlesgate at 535 Beacon. Sarah Anna Hallett died in December of 1905. In her will, she left one-third of her estate to her husband, and two-thirds to their only child, Daniel Emery Hallett. On January 31, 1906, he transferred his interest to his father, who continued to lease the property to others. By the 1906-1907 winter season, 441 Marlborough was the home of Dr. Daniel Crosby Greene, Jr., and his wife, Marion (Lockwood) Greene. They previously had lived in an apartment at 479 Beacon. D. Crosby Greene, Jr., was a physician specializing in the nose and throat. He maintained his office at 483 Beacon. The Greenes continued to live at 441 Marlborough until mid-1912, when they moved to Newton Centre. By the 1912-1913 winter season, 441 Marlborough was the home of real estate trustee Harris Hooper Lawrence and his wife, Theodora Maria (Eldredge) Lawrence. They previously had lived at The Stratford apartments at 31 Massachusetts Avenue. 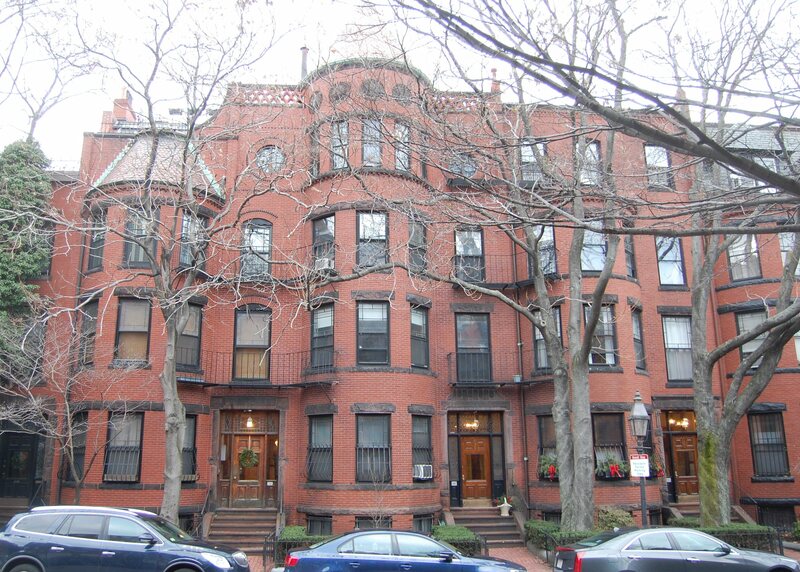 They continued to live at 441 Marlborough during the 1918-1919 winter season, but moved thereafter to Brookline. By the 1923-1924 winter season, they were living at 470 Beacon. By 1920, 441 Marlborough was the home of Daniel B. Hallett’s niece, Miss Mary Ellen Waller, the daughter of his brother-in-law and sister, David Francis Waller and Mary Doane (Hallett) Waller. She previously had lived in Brookline with her mother, who died in April of 1919. Mary Waller was a prolific novelist whose career spanned from about 1890 to 1931 (although born Mary Ellen Waller, she wrote under the name Mary Ella Waller). At least one of her books, Deep in the Hearts of Men, published in 1924, was written while she lived at 441 Marlborough. By 1922, she was joined by her uncle, Daniel Hallett, who had been living at the Hotel Tuileries at 270 Commonwealth. They continued to live at 441 Marlborough until about 1925, when they moved to Washington DC. On October 13, 1925, 441 Marlborough was acquired from Daniel Hallett by real estate dealer Daniel J. Cronin, and on Octobert 30, 1925, it was acquired from him by Martha (Gately) Cogan, the widow of Thomas Francis Cogan. She lived at 47 Prentiss. 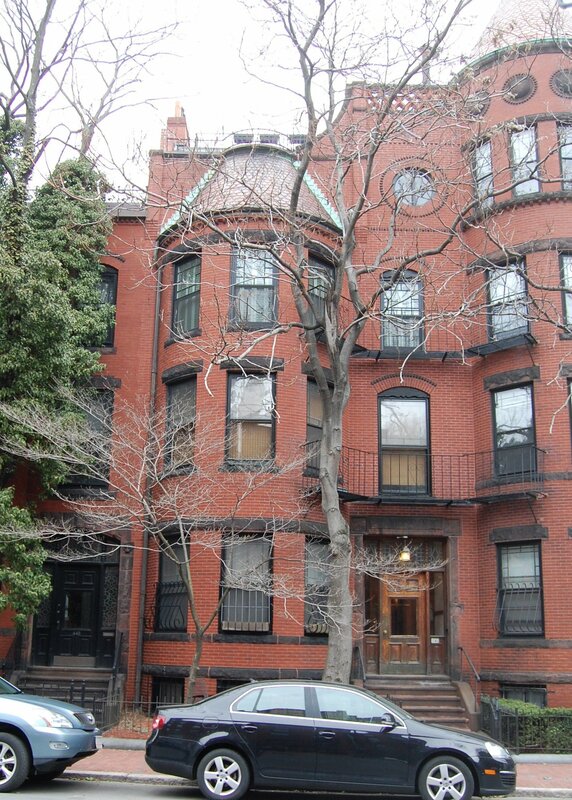 By the 1927-1928 winter season, 441 Marlborough was the home of John (Jack) J. Mills and his wife, Hazel Beatrice (McIntyre) Mills, who operated it as a lodging house. They previously had lived at 477 Commonwealth. By 1929, they had moved to an apartment at 421 Marlborough, where they also accepted lodgers. By 1933, they were living at 425 Marlborough. 441 Marlborough was not listed in the 1929-1931 Lists of Residents and was shown as vacant in the 1930 and 1931 City Directories. 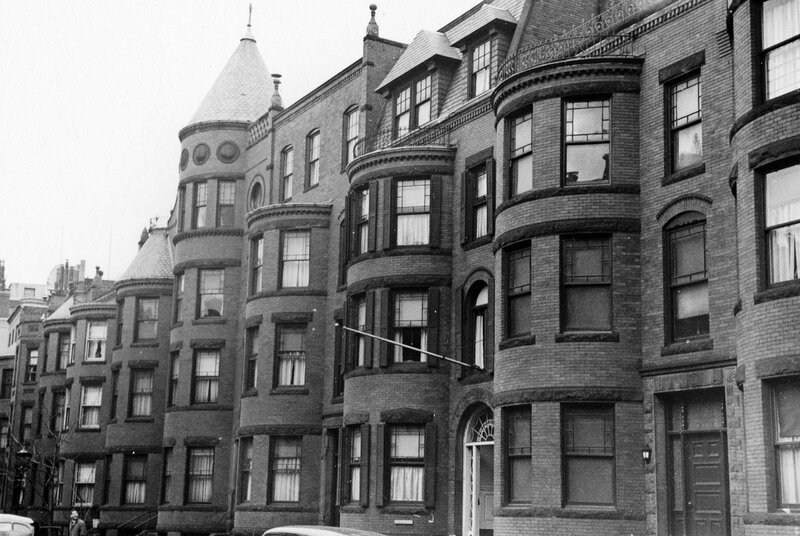 On June 12, 1931, the Massachusetts Hospital Life Insurance Company foreclosed on a mortgage given by Martha Cogan and took possession of 441 Marlborough. On July 14, 1931, 441 Marlborough was acquired from Massachusetts Hospital Life Insurance by real estate dealer Shirley Clifford Speed, and on September 14, 1931, it was acquired from him by Miss Marie Louise Margot of New Orleans. 441 Marlborough became the home of Marie Louise Margot’s sister, Mrs. Julia (Margot) Bushman, the former wife of Victor Carl Bushman. She previously had lived in an apartment at 194 Huntington. William E. Felt, a printer, also lived at 441 Marlborough and operated his business, the Felt Press, from the house. On January 2, 1940, Marie Louise Margot recorded a deed transferring 441 Marlborough to her sister. The deed was dated September 28, 1931, two weeks after Marie Louise Margot had acquired the property from S. Clifford Speed. Julia (Margot) Bushman and William Felt continued to live at 441 Marlborough until about 1944. On September 27, 1944, 441 Marlborough was acquired from Julia Bushman by Martha M. (Roy) Gotreau, the widow of David B. Gotreau, and their son, Joffre Gotreau. They had purchased 437 Marlborough in April of 1944, and operated both properties as lodging houses. Martha Gotreau lived at 441 Marlborough. She previously had lived in Lowell. Joffre Gotreau lived at 437 Marlborough until about 1945, when he moved to 441 Marlborough and then to 261 Marlborough. By 1947, Martha Gotreau was joined at 441 Marlborough by her daughter, Cecile Elizabeth Germaine (Gotreau) Alves, the former wife of Anthony Alves. In April of 1952, Martha Gotreau acquired 439 Marlborough and transferred it to Cecile Alves, who moved there and operated it as a lodging house. Joffre Gotreau (still living at 261 Marlborough) was listed in the City Directories as the operator of the lodging houses at 437-439-441 Marlborough until the early 1960s. 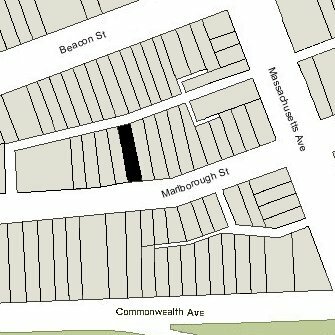 Martha Gotreau lived at 441 Marlborough until about 1960, after which she moved to 437 Marlborough, where she continued to live until about 1966. Cecile (Gotreau) Alves continued to live at 439 Marlborough until about 1966. In April of 1967, she transferred 439 Marlborough back to Martha Gotreau, and she transferred it to herself and her son, Joffre. On June 29, 1967, 437-439-441 Marlborough were purchased from Martha Gotreau and Joffre Gotreau by Milton B. Popkin and Louis Grolnic. They continued to operate them as lodging houses. On April 3, 1974, 437-439-441 Marlborough were purchased from Milton Popkin and Louis Grolnic by Jerald R. Feldman and Harvey P. Wilk, trustees of the 437, 439, 441 Marlboro Street Realty Trust. They continued to operate them as lodging houses. Jerald Feldman and Harvey Wilk sold 437-439 Marlborough in March of 1982. On April 23, 1984, he transferred the property to himself as an individual. On May 9, 1985, Barry Libert converted 441 Marlborough into four condominium units, the 441 Marlborough Condominium.